Welcome back to Wonka Week! Ok, while I'd love to cover one of these a day, they are way too high octane (fatty) to be downing them like that, no matter how tasty they might be. So, I have to pace myself, but I think 3 hours of yard work justifies a nice treat. Let's dig in! Be honest, it sounds a little tame right? I mean, who hasn't pulled out the triple chocolate ice cream at one point or another? It sounds like there might be something special about this ice cream after all. The fudge swirl doesn't seem that prevalent, but there are chocolate hunks everywhere. I am starved and waste no time digging in. 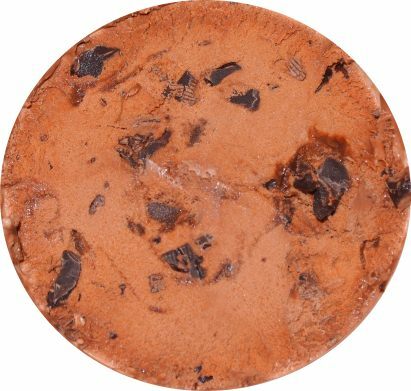 I take a few bites and it's got a whole lot of chocolate going on. I take a few more bites and I made a quick diagnosis: Wonka has done it again! 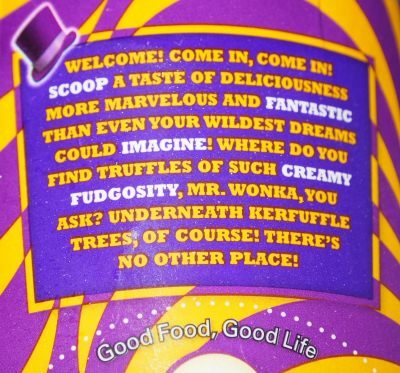 This may not be the finest chocolate base ever (it's hard to beat something like Chocolate Therapy), but Wonka has got a winner here because of two neat features. The first highlight is the fudge swirl that you see in the picture above. If you look carefully at the coloring and texture, you might notice that it's not so much a typical thin chocolate sauce but in reality is a true fudge swirl. It actually has a fudge like consistency that I'm not sure I've ever seen before in an ice cream (at least not in a very long time). You don't get huge swirls of it, but when you hit a puddle of it like I did in the picture above, well, it's a nice taste that makes you want more and more. Ahhh, I just thought of it: The swirl is very much like a prepackaged fudgy cake frosting. Tasty, I just wish there was more of it! Now that would, and probably should, be enough for you, but then there are the "kerfuffle" "truffles". I know a lot of people love the huge fudge chunks in Graeters, but I found them a bit overbearing. Sure, they were good, but all too often I would wind up with a huge chunk of chocolate and no ice cream. (Wow, I sound like some chocolate-hating person-type guy). Now, what if Wonka took a big fudge chunk like that but tweaked the recipe so that as you scooped the truffles, they break apart? 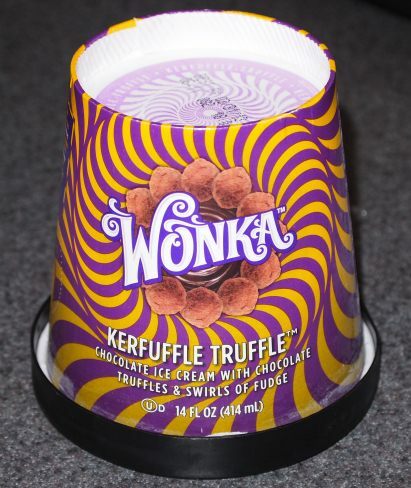 That's right, for the first time ever, Wonka has taken a fundamentally simple concept like the chocolate "chip" and turned it on it's head by perfecting it into the kerfuffle truffle. How cool would Cherry Garcia be if it's mammoth chocolate chunks broke apart on impact? Now I didn't even notice the phenomena at first, I just thought it was a fluke, but then it kept happening over and over again. It's just so cool! You may see a big chocolate chunk, go for it, and it breaks into 4 similar sized pieces with some on your spoon and some in the container. You might think this is a bad thing, but have no fear because these truffle bits are everywhere! What a totally fun way to spice things up. I would have been happy with just another chocolate overload flavor, but yet again I find myself enjoying the experience of eating my ice cream as much as the taste of it. I love these chocolate bits and I wish more flavors had these in them. 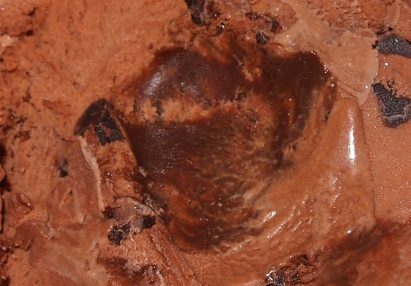 It's a big burst of chocolate flavor and texture, but without a big thud or displacement of ice cream. These softer truffle bits break apart and help spread the chocolatey goodness all around. I'm enjoying every bite here. On Second Scoop: I still like this one, it's fun. I think I need to reiterate that this is not some super fantastic ice cream base, it's actually fairly typical. This isn't B&J or H-D. What got me was how much fun the chunks were as well as the delight of hitting a big gooping of fudgy swirl (yes I made up that word because I can't think of anything better). So I was probably a little over excited on the first scoop, but I still like it and everyone else in the house enjoyed it as well. Can't wait to hear about those so called "liquid choc chips" in the raspberry vanilla flavor. 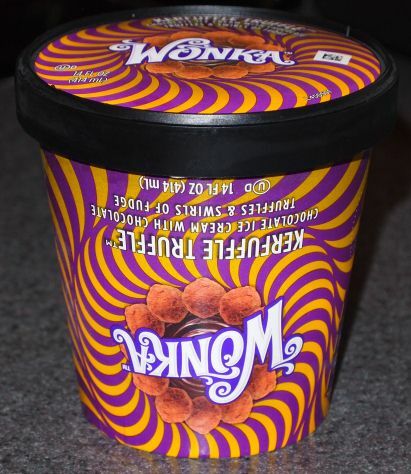 I wish I could try these Wonka flavors even though the container on this one makes me dizzy. I wonder if they will stack these right side up or design side up? oh man, i hadn't even though about that... they'll probably be awesome. hmmm, I may have not underscored that point enough in my review. I mentioned that it's not the best chocolate flavor, but it was the truffle bits that won me over. I wont argue that base couldn't be better.